This week's burger is another one inspired by my time at the Waffle House. That's where I was first introduced to the melty deliciousness that is the patty melt. I had a regular customer who used to order a bacon patty melt whenever he came in, and when I served it to him I'd watch him mix together his own little sauce for it, using mayonnaise, ketchup, and Worcestershire sauce. Then he'd pile the sauce on his burger along with a bunch of pickles and eat the sandwich in huge, messy bites. That sauce looked delicious, so I decided I'd try it at home. In a moment of inspiration, I chopped up some pickles and put them directly in the sauce, and what do you know? It's an amazing concoction. I've served it on our homemade patty melts ever since. I use white bread for our melts, since we wouldn't go through an entire loaf of rye. 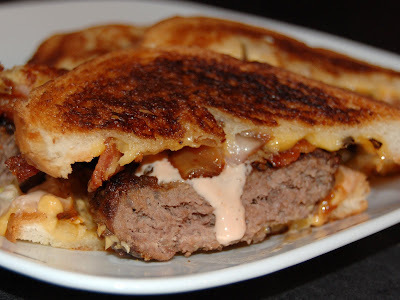 Other than the sauce and the bread, my patty melt is pretty traditional: a seasoned beef patty, topped with caramelized onions, melty American cheese, and a couple of slices of bacon, served on butter-grilled bread. I think the sauce really adds something different to the burger, a salty, tangy, slightly sweet element that really works with the rest of the flavors. 1. To make the sauce, combine mayonnaise, ketchup, Worcestershire sauce, and chopped pickle; refrigerate. 2. To make the burgers, fry bacon to desired crispness in a large skillet. Remove to paper towels to drain. Season burgers with hamburger seasoning and fry in bacon grease to desired doneness. 3. While burgers are cooking, cook onions in butter over medium heat until softened and caramelized, about 10 minutes. Season with salt and pepper to taste. 4. Butter each slice of bread. Top each with a slice of cheese, and cook over medium heat on a griddle until lightly browned and cheese is melted. Top 4 slices of bread with a burger patty, a quarter of the grilled onions, and 2 slices of bacon. Slather some of the special sauce on the other 4 slices of bread and make sandwiches. Oh my gosh, I am a sucker for a patty melt. And that sauce sounds great. We make a sauce just like that-- but with mustard added to it-- to put on our hot roast beef sandwiches. It's my favorite sauce ever! i made a similar recipe tonight and i used the sauce you posted...it was delicious! i love your burger and fries friday concept...they all look delicious!